I’m not typically a ‘truck’ shooter, they generally don’t do anything for me, although I am starting to appreciate some of the design work of earlier trucks. When I visited the Concours d’Elegance at St. John last year I was struck by this particular truck. It is a 1936 Terraplane Express Cab Truck manufactured by the Hudson Motor Car Company. The Terraplane name replaced the earlier ‘Essex’ nameplate as the lower priced companion car to the Hudson. This particular truck was used on a dairy farm to haul milk cans and then used at an upstate New York garage. It was found in the basement of a house where it had been stored and underwent a 3 year restoration. 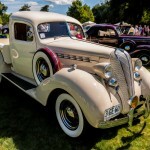 The Concours d’Elegance at St. John is coming up this weekend (July 28th) and in preparation I thought I might post an image or two taken at some past shows. 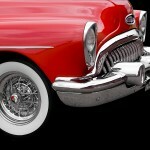 This image was taken at the 2010 Concours d’Elegance held at Meadowbrook Hall near Rochester Hills, Michigan. 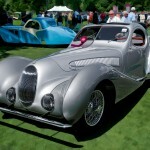 The Concours was held at Meadowbrook for years, but for various reasons the event shifted to a larger venue at St. John near Plymouth, Michigan. 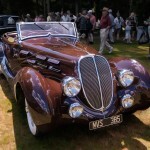 The car in the shot is a 1938 Darracq/Talbot Lago T-150-C Roadster by Figoni & Falaschi. One of my favorite cars of all time is the 1936 Cord. It has really great lines, cool chrome exhausts and I love the ‘coffin nose’ hood. This particular Cord is a 1936 Cord Convertible Coupe and it one of many vintage Cord’s that are on display at the Auburn, Cord, Dusenberg Museum in Auburn, Indiana. 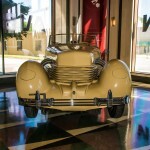 Not only does the museum have Cord automobiles of different vintages, they have a wonderful collection of Auburns, Dusenbergs and other classic automobiles. The museum is housed in the original Auburn Automobile Company factory and headquarters. The main floor of the museum occupies the old showroom. This particular cord is displayed on a rotating platform, much as it might have been when it was on display in the original showroom. >I was going through my Lightroom catalog spending some time adding keywords and looking at images that I had ignored in the past when I came across this shot I took of a 1932 Lincoln. The car was part of the Classic Car Club of America show held at the Gilmore Car Museum. 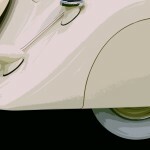 I really like the look of some of these old cars, especially the swooping lines of the fenders over the wheels. When I saw the image in the catalog, I immediately thought it would look good with a more painted look. The way the clouds were reflecting on the fender already had a sort of painted look so I enhanced it by applying some Topaz Simplify to the entire image. Just for kicks I wondered how the image might look with a bit more contrast, so I took the image into Silver Efex Pro2 and choose one of the darker presets which added just the contrast that I wanted. The black and white conversion made the tail light too dark, so I masked out the conversion, and applied a separate black and white layer which made the red color lighter, not darker. 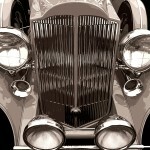 Yesterday I posted an image of a 1935 Duesenberg taken at the 2008 Concours d’Elegance held at Meadowbrook Hall. This image was taken from the 2007 Concours and was my first time visiting the show. The car in this image is a 1933 Packard V-12 Convertible Coupe, and is just one of fifty that were ever built. 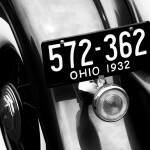 When new, the car sold for $4,000, which in 1933 was a great deal of money. 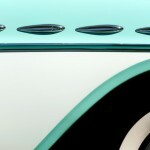 The Deusenberg is one of my favorite classic automobiles. The car just exudes power and class, and the companies that did the coachwork created automobiles with wonderful details. I took this shot at the 2008 Concours d’Elegance held at Meadowbrook Hall in Rochester Hills, Michigan. The car is a 1935 Duesenberg Model JN Roadster with coachwork by Bohman and Schwartz. The car has an interesting history. According to information displayed with the car, the automobile was purchased for Clark Gable from his wife, Carole Lombard. Gable owned the car until 1942 until his wife’s death at which time it was given away with instructions that it never be seen in California while he was still alive. This shot was taken a couple of years ago when my wife and I were in New York City celebrating our anniversary. My wife had never been to Grand Central so we decided to check it out. 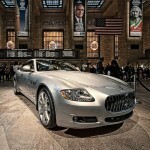 On display in the main concourse was this Maserati Quattroporte automobile. I like shooting cars and architecture, so this seemed like a perfect find! It was cloudy outside and there wasn’t a lot of bright light flooding Grand Central so the lighting wasn’t the greatest. I was using my Olympus E-3 which tends to be grainy at higher ISO’s so I stuck with ISO 100. The car was isolated from the unwashed masses with heavy velvet rope held up by a series of metal poles. I was able to set my camera on top of one of the poles to get this shot. The image is rather sharp even though the exposure was just 1/6th of a second.